For locations where the fence is as much a feature as the view, we recommend Post & Rail fencing to add a rustic charm. 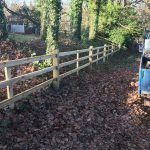 The Oxshott fencing example below is a typical example of how post-and-rail fencing works well bordering a rural type home. While simply designed, the fencing remains as sturdy as the rest of our services range and can be built to suit a range of heights and other requirements. The design is ideal for the fronts or sides of your home, overlooking fields and gardens.